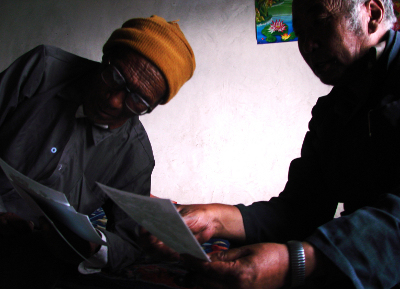 During my fieldwork in Tibet, I carried with me photographs taken by travellers and anthropologists who went there before, and hoped that someone recognizes the people in those photographs. And yet, I was surprised when it happened. 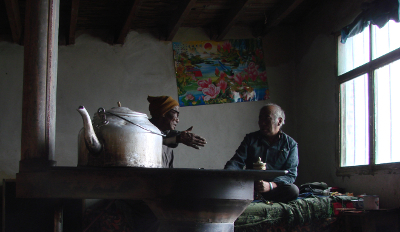 Sitting in a small village somewhere in the mountains, eating candies and fried bread, I conducted an interview with an elderly nomad. The man – advanced age, with a brown face and a grizzly-like posture – sat on the other side of the stove, answering my questions. His wife, perched on a small stool like a little bird, got up every now and then to pour more tea. Carrying a huge kettle, she threw a few words into our conversation. The leading voice belonged to the man, but she made sure that what he said agreed with what she remembered. The man talked about the past, which land belonged to which tribe, and how Ma Bufang, the governor of Qinghai, wrote this on paper, sealed it, and handed it to the leader of the tribe to which my hosts belonged. His signature and stamp testified that this piece of land belonged to these people and to no one else. That was during the time of the Republic of China. Now it is the People’s Republic and many things have changed. That tribe leader who got Ma Bufang’s sayig or land decree could not be among the living anymore, but he could have some living relatives. “Yes, his son is here”, my host said. “How do I find him?”, I jumped with excitement. “He’s around, sometimes here, sometimes there…”, the answer did not sound promising, but was typical of a society where people move a lot, coming and disappearing again. At that moment, the door to the mud house opened. A man in a yellow hat and thick glasses on his nose entered the room limping slightly. “Well, here he is!”, my hosts exclaimed. Astonished with this deus ex machina way in which the old leader’s son appeared in the door, I only managed to ask, “How did you know you should come right now? !” The man, already in his late eighties, answered, “I always know where nice ladies are”. I moved closer and, sitting almost at his feet, absorbed his words with almost all senses: the history of old tribal leaders, of his father who got the land from Ma Bufang and of what happened later. “Can you show him the photos?”, my host asked. Everyone knew that I had with me a folder full of photographs, those which both I and other people took, sometimes decades ago. Among the latter, there were photographs by Joseph Rock from the National Geographic Magazine. The old leader’s son studied them carefully. Suddenly, his face brightened. “I knew this man”, he said. There was a photo of a man with a cocked hat and eyes looking straight into the camera. “Gomba, nicknamed Dadda, chief of the Jazza clan”, the caption said. “Not Jazza. Lowa”, the old leader’s son corrected. “His name was Lowa Ngawang”. A story followed. The old leader’s son was jailed in 1958, when Tibetans clashed with the Chinese Communist troops. He was lucky and was released quickly, but many of his relatives never left prison alive. There, in prison, he met the man from the photograph: Ngawang, chief of the Lowa tribe who neighboured Jazza. Lowa Ngawang was there together with one of his sons, a Buddhist lama. They were jailed by his other son who supported the new power. “He tortured them a lot, even your worst enemy wouldn’t have done so”, the man said. Lowa Ngawang was 73. He died one month later. What happened to his monk-son is unclear. For Lowa Ngawang alias Dadda the history ended in 1958. But what happened to his younger son, who secured for himself a place in the ranks of the new Communist functionaries in his region? He was removed from his post during the Cultural Revolution, when many followers of the new government lost their jobs, and sometimes their lives during outbreaks of violent struggle sessions. That was his fate. The story could be a basis of another Shakespeare-like tragedy: of family betrayal and craving for power. The wheel of history turned, destroying both the father, the leader from the old times, as well as his son, a communist, who had gained power, but all together it was only a short-term guarantee of survival. People from the past, photographed by travellers or anthropologists, are not anonymous representatives of their folk. Their faces, stored in archives and reproduced in books, detached from their owners, gain a life of their own, becoming “vignettes” of their time or region they come from. How many such images do we have, not knowing whose faces these really are? Intricate paths of life, history and coincidence made these people step into a photographer’s lens and start another, photo-life. But they once had names and biographies which later on were lost in transmission. Lowa Ngawang alias Dadda played an important role in Rock’s narrative being his guide to Golok, but we know little about him. During that interview, he stopped being just a figure in a travelogue and regained part of his biography. However, he was an important person in his community. Would it also be possible to find something about those people who were less important, who were not guides but nameless escorts, not leaders but nomads whose paths accidentally crossed with those of the photographer and whose names the photographer never knew? Scores of unknown people from the past, both women and men, populate our books. Maybe it is still possible to return some of these faces to their owners. Joseph Rock’s photograph courtesy of Harvard-Yenching Library. The author thanks Norma Schulz for her help in editing this post.